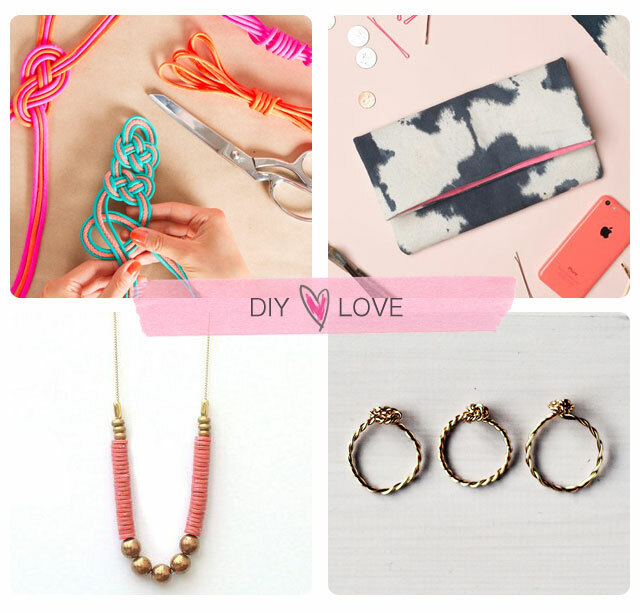 Some DIY love for a Friday, I have the whole of Sunday afternoon scheduled for some making and I can't wait. If you're looking for inspiration this weekend then take a look at some of these beauties to get you started. These knots from Kollabora caught my eye, I don't like to say it but about this time of year I start thinking about my Christmas wrapping (sad I know) I think these knots could look great incorporated into gift wrapping. I love this ink dyed purse from The House That Lars Built, that coral coloured lining that really gets me and I can never resist a purse. I haven't made a long necklace in a while so would like to give this brass version a try, it seems perfect for jazzing up weekend jumpers. My wedding band is a twisted ring so I absolutely love these golden versions from Fall For DIY.